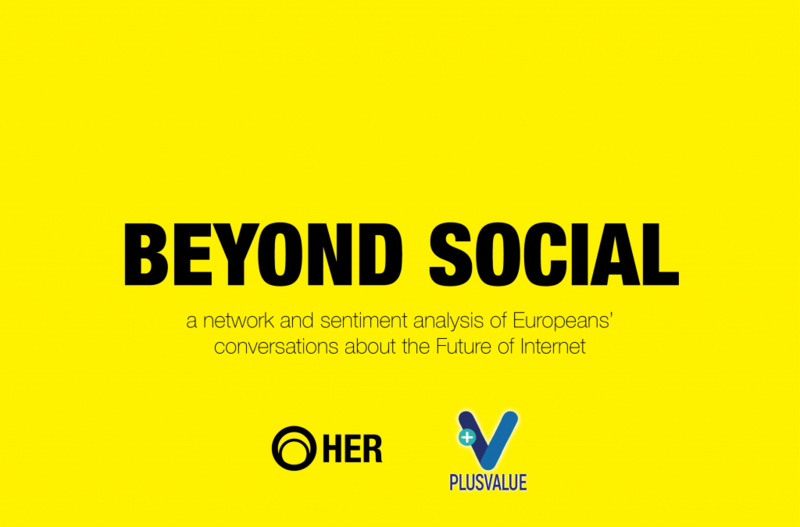 A research in partnership with PlusValue, using cutting-edge technology to collect and analyse online data in 54 different languages via natural language processing, machine learning, pattern and named entity recognition and network and sentiment analysis to better understand what people express when they express about the impact that internet technologies will have on their lives, jobs and on society at large in the next future. 669.734 messages generated from 355.451 users, between November 10, 2016 and April 30, 2017. It’s aim is to better understand stakeholders’ thoughts, expectations, desires, concerns, visions and imaginations based on their expressions when talking about internet technologies and their impact on our lives, societies and the economy. The HER and PlusValue team: Fiorenza Lipparini, Oriana Persico, Salvatore Iaconesi, Guido Romeo, Emanuele Rizzardi and Eugenio De Matteis. Each visualization allows you to explore the data, just by clicking and navigating it, and it is coupled with an open data set freely usable by anyone. Institutions, journalists, newspapers, universities, researchers, students, artists, citizens, companies are invited to use it, and to share the results, so we can communicate, collaborate, reflect, criticize and build together FoI, the Futures of Internet. Explore the languages in which expressions have been collected: Twitter, Instagram, 500 thematic Facebook groups and pages from all over Europe, in 54 different languages. Visual comparison between the numerosity of expressions about the Future of Internet, Brexit and Soccer. The tag-cloud shows the hottest topic discussed by European citizens while speaking about the Future of Internet on major social networks. 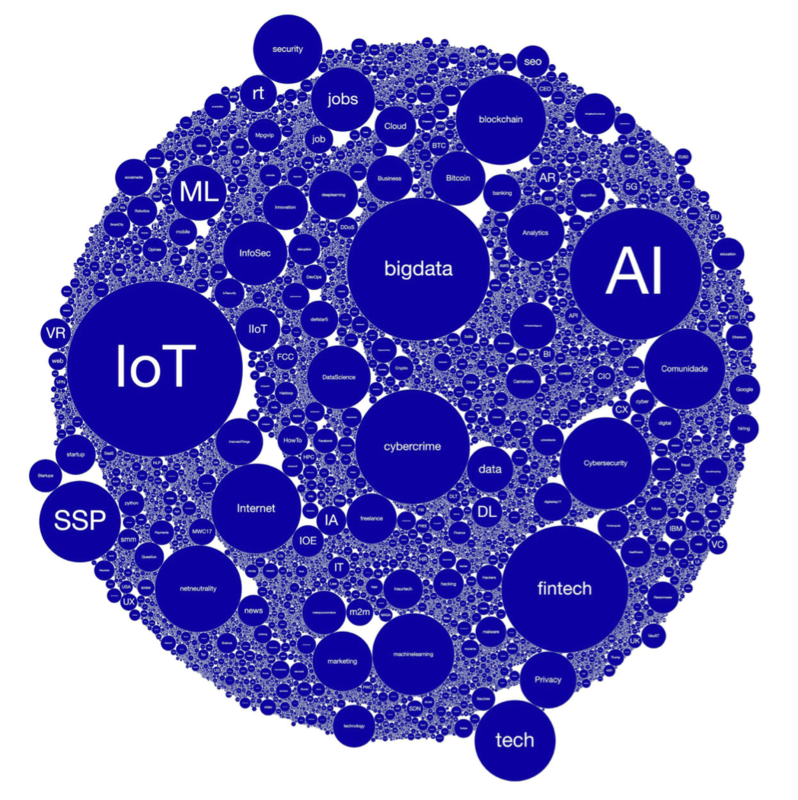 Here the top five topics: IoT (70.967); BigData (43.989); Artificial Intelligence (37.676); Fintech (34.777); Cybercrime (28.206). 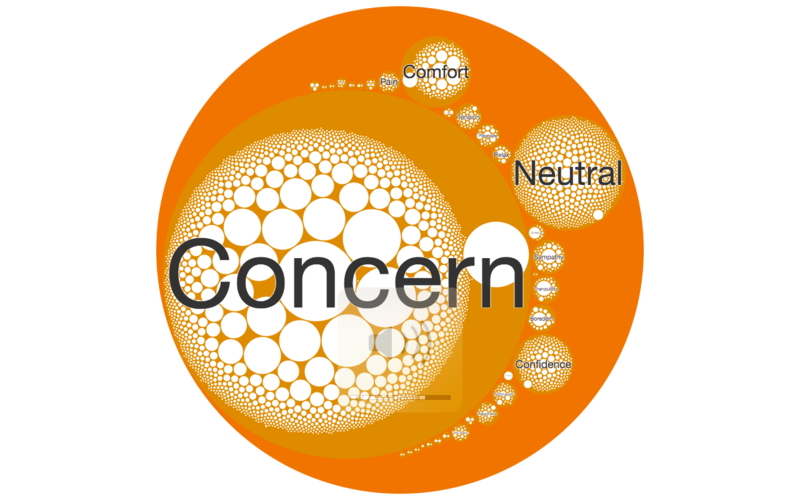 The principal emotional expressions associated to the topics in the conversations about the Future of Internet. The relations among the main topics in the conversations about the Future of Internet (that is: “when people are talking about x, they are are also talking about y”). The ages and genders detected in the subjects expressing about the Future of Internet. The most active people are between 35 and 54 years old. They are predominantly male (84.606 male against 33.218 female). And guess what? The less active one are the under 21, or so called “Millennials”, with 9.571 male and 5.114 female. The table shows the distribution of emotions expressed by people discussing the Future of Internet on social networks, according to the Circumplex Model of Affect. The model classifies emotions using two dimensions: comfort/discomfort and arousal. Combining the age, emotions and topics, is possible to analyze the data using a series of techniques to identify interesting and recurring patterns. In this case, using Machine Learning, three relevant profiles of user have been identified, showing recurring behaviors and attitudes toward the Future of Internet. The Optimst has a strong, positive opinion on the hot topics of the innovations on the Future of Internet. It follows the themes of Data, IoT, Security, Business and Education in very active ways, expressing possibilistic opinions which leave very little space for critique. It wants something to happen. The pattern has been identified in 146.278 users. The Activist is practically the opposite of the Optimist. It systematically creates frictions in discussions on the Future of Internet, tending to highlighting the dangers and negative effects and impacts of most technological innovations. It is very useful in discussions because it creates frictions and polarizations, causing people to choose what sides they want to be on. It expresses critique which is smart and informed, but leaves little space to opportunity. The pattern has been identified in 162.994 users. The Exploiter focuses on the business uses of the technological innovations connected to the Future of Internet. It is a profile which does not critique, and is only vaguely interested in the more critical topics, such as NetNeutrality or Security. On the other hand, the profile is very interested and active in understanding how things can be applied to generate novel businesses. It is also a profile which is very actively engaged in the evolution of education and of the skills and competences needed to confront with the future.The pattern has been identified in 126.105 users. The different types of accounts expressing about the Future of Internet. If we constantly interact with non human entities each days, such as bots, automatic agents, companies, how many of them influence (or simply take part) the discussion about the Future of Internet? Discover it trough the visualization. A model of the networks involved in the discussions about the Future of Internet. In general, discussions about the Future of Internet occupy the smallest portion of the communication flow (with a total of 181,277 messages), the largest one is news sharing (with 522,894 messages) followed by campaigns (with 425,897 messages). And again are Bots and Automatic Agents which generate most of the messages of the campaigns, with 216,390 messages, followed by companies and organizations with 162,661 messages and individuals with 46,281 messages.